UPDATE: 7/13/13 – Landon Brittain, 31, formerly of Coal City, has been charged with vehicular hijacking, aggravated vehicular hijacking and obstruction of justice, and had bail set at $1 million in DuPage County Court on Thursday, according to the Chicago Tribune. Brittain was arrested in June by Venezuelan intelligence in Caracas, the site said, and extradited to the U.S. to face charges. He is accused of conspiring with Michael Buhrman, 32, also of Coal City. Buhrman remains a fugitive after being convicted in May in absentia. 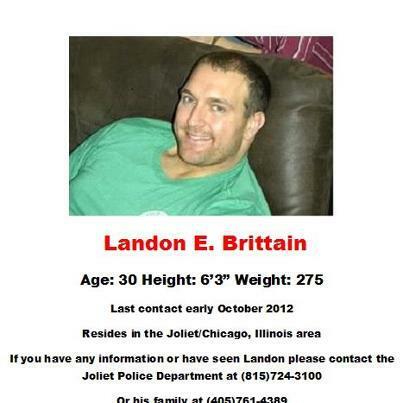 Landon Brittain from Indiana has been missing since October, 2012. The family believes that Landon may be willing missing, but nevertheless they want to make sure he is safe and at least like him to call them and let them know he is okay. Per Landon’s Missing Facebook page: “Landon is missing, but it seems it is by choice. He did not notify his friends or his family (at least none that I have found so far) that he was leaving. He made great efforts to ensure that he could not be found. He took very little from his home, but we are sure he had a large amount of money. If you see him, would you please contact the Joliet Police Dept. 815-724-3100. Looks like he was found – currently residing in DuPage county lockup awaiting trial for carjacking charges in the US…with other charges pending for crimes in Venezuela. Smart decisions Landon….